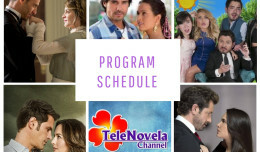 The Two Sides of Ana: Episode 43 | TeleNovela Channel - Bringing you closer to lifes drama. An employee of the shoe shop tells Claudia and Irene that Otto is a drug dealer. Meantime, Irene gives Rafael an infected spoon to use while Humberto gets upset as he sees Vicente giving Marcia a dress. Ignacio continues to get upset as he receives anonymous messages and some ashes.